"A perfect fit, every time." Guardhouse coin holders are engineered to precisely fit United States coinage. Your coins will not get stuck in these holders. Nor will they rattle around. From the Penny to the American Silver Eagle, Guardhouse coin capsules are the industry leader in both quality and price. Guardhouse round coin holder capsules in 10 packs with peg holes for retail display. Guardhouse direct-fit round coin holders are packed 10 capsules to the box and are the ideal size and quantity for resale in stores. Available in nine different sizes: Cent, Nickel, Dime, Quarter, Half Dollar, Small Dollar, Large Dollar, Silver Round and American Silver Eagle. Guardhouse retail header cards include one direct-fit coin capsule each. Packed in boxes of 10 each, these handing cards have a perforated back for easy removal of the coin holder and are perfect for retail display. This 19mm capsule fits U.S. cents. Capsule Size: Small. Guardhouse retail header cards include one direct-fit coin capsule each. Packed in boxes of 10 each, these handing cards have a perforated back for easy removal of the coin holder and are perfect for retail display. This 21.2mm capsule fits U.S. nickels. Capsule Size: Small. Guardhouse retail header cards include one direct-fit coin capsule each. Packed in boxes of 10 each, these handing cards have a perforated back for easy removal of the coin holder and are perfect for retail display. This 17.8mm capsule fits U.S. dimes. Capsule Size: Small. Guardhouse retail header cards include one direct-fit coin capsule each. Packed in boxes of 10 each, these handing cards have a perforated back for easy removal of the coin holder and are perfect for retail display. This 24.5mm capsule fits the U.S. quarter dollar. Capsule Size: Small. 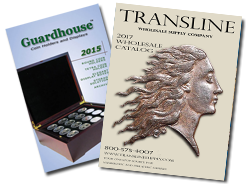 Guardhouse retail header cards include one direct-fit coin capsule each. Packed in boxes of 10 each, these handing cards have a perforated back for easy removal of the coin holder and are perfect for retail display. The 30.6mm with a medium exterior will fit the following coin half dollar types Liberty Seated, Barber, Liberty Walking, Franklin, and Kennedy. Capsule Size: Medium. Guardhouse retail header cards include one direct-fit coin capsule each. Packed in boxes of 10 each, these handing cards have a perforated back for easy removal of the coin holder and are perfect for retail display. This 26.5mm capsule fits the Presidential dollar, Sacagawea and Susan B Anthony dollars. Capsule Size: Small. Guardhouse retail header cards include one direct-fit coin capsule each. Packed in boxes of 10 each, these handing cards have a perforated back for easy removal of the coin holder and are perfect for retail display. This 38.1mm capsule fits the large dollars, including Morgan, Peace and Ikes. Capsule Size: Large. Guardhouse retail header cards include one direct-fit coin capsule each. Packed in boxes of 10 each, these handing cards have a perforated back for easy removal of the coin holder and are perfect for retail display. This 40.6mm capsule fits the 1oz American Silver Eagle. This holder also fits larger sized poker chips with diameter greater than 39.3mm. Capsule Size: Large. Guardhouse retail header cards include one direct-fit coin capsule each. Packed in boxes of 10 each, these handing cards have a perforated back for easy removal of the coin holder and are perfect for retail display. Guardhouse retail header cards include one direct-fit coin capsule each. Packed in boxes of 10 each, these handing cards have a perforated back for easy removal of the coin holder and are perfect for retail display. Capsule Size: Small. Guardhouse retail header cards include one direct-fit coin capsule each. Packed in boxes of 10 each, these handing cards have a perforated back for easy removal of the coin holder and are perfect for retail display. Capsule Size: Large. Guardhouse direct-fit coin capsules in convenient retail 10 packs. These capsules are made with archival, scratch resistant acrylic (PMMA) and are hand packed with tissue paper between each capsule to ensure quality. The 19mm with a small exterior will fit the following coin cent types Fly Eagle, Indian Head, and Lincoln. Guardhouse direct-fit coin capsules in convenient retail 10 packs. These capsules are made with archival, scratch resistant acrylic (PMMA) and are hand packed with tissue paper between each capsule to ensure quality. The 21.2mm with a small exterior will fit the following coin nickel types Liberty Head, Buffalo, and Jefferson. Guardhouse direct-fit coin capsules in convenient retail 10 packs. These capsules are made with archival, scratch resistant acrylic (PMMA) and are hand packed with tissue paper between each capsule to ensure quality. The 17.9mm with a small exterior will fit the following coin dime types Liberty Seated, Barber, Mercury, and Roosevelt.